To manually create a wireless network profile, click “Manually connect to a wireless network,” and then click Next. You should see Figure 4. Figure 4 The page that lets you enter information for the wireless network you want to add. Network name; Type the name of the wireless network. No authentication (Open) Open system authentication with no encryption. WEPOpen system authentication with Wired Equivalent Privacy (WEP). WPA2-Personal Wi-Fi Protected Access 2 (WPA2) with a pre-shared key (also known as a passphrase). WPA-Personal Wi-Fi Protected Access (WPA) with a pre-shared key. WPA2-Enterprise WPA2 with IEEE 802.1X authentication. WPA-Enterprise WPA with IEEE 802.1X authentication. 802.1xIEEE 802.1X authentication with WEP (also known as dynamic WEP). The choices will depend on your wireless network adapter capabilities as reported to Windows. If an authentication type doesn’t appear in the list, ensure that your wireless adapter supports the type and that you’ve installed the latest driver for your adapter that’s compatible with Windows 7. The shared key authentication method is not listed. Microsoft strongly discourages its use because it provides weak security for your wireless network. To configure shared key authentication, select No authentication (Open) here and then select Shared from the Security tab in the properties of the wireless network (described later in this article). Encryption type: Select the method used to encrypt data sent over the wireless network. The choices depend on the selected security type. When you select the — No authentication (Open) security type, None is selected for you. When you select the — WEP security type, WEP is selected for you. When you select the — 802.1x security type, WEP is selected for you. When you select the — WPA2-Personal, WPA2-Enterprise, WPA-Personal, WPA-Enterprise security types, you can select AES or TKIP. As before, the encryption choices listed depend on your wireless network adapter capabilities as reported to Windows. Security Key: Type the WEP key (if you selected the WEP security type), the WPA preshared key (if you selected the WPA-Personal security type), or the WPA2 preshared key (if you selected the WPA2-Personal security type). For the WPA2-Enterprise, WPA-Enterprise, and 802.1x security types, Windows 7 automatically determines the security key when performing 802.1X-based authentication. Hide characters: Specifies whether you want to view the value typed in Security Key. 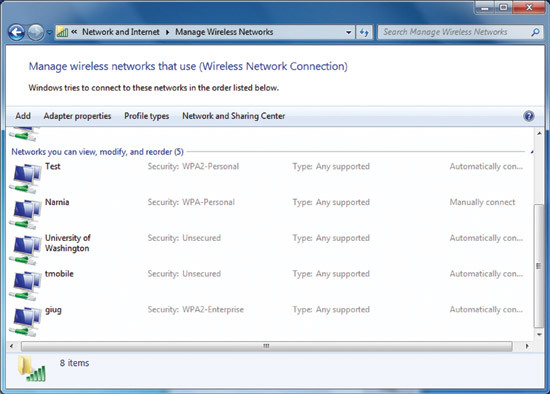 Start this connection automatically: Specifies whether Windows 7 will automatically connect to this wireless network. If you clear this checkbox, you must manually connect to the wireless network from the list of networks available from the Network notification area icon. 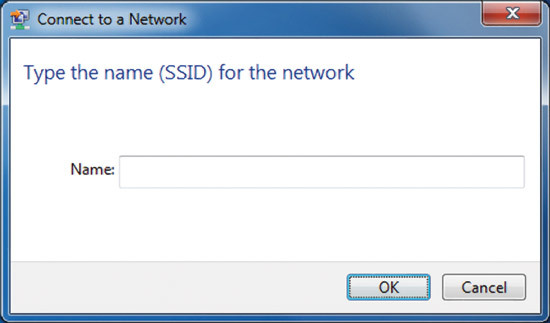 Connect even if the network is not broadcasting:Specifies whether Windows should attempt to connect even if the wireless network is not broadcasting its name. This will cause Windows to send Probe Request frames to locate the wireless network. These probe request frames can be used by malicious users to determine the name of the non-broadcast network. For more information about the privacy issues of non-broadcast networks, see Non-broadcast Wireless Networks with Microsoft Windows. When you click Next, you should see Figure 5. Figure 5 The Successfully added page. You can click Change connection settings to access the properties of the wireless network, as described later in this article, or click Close. You can access the Manage Wireless Networks dialog box from the Manage wireless networks link in the Network and Sharing Center (see Figure 6). Figure 6 The Manage Wireless Networks dialog box. Note: If the Manage wireless networks link is not present from the Network and Sharing Center, click the “Change adapter settings” link and ensure that your wireless network adapter is enabled on your laptop or notebook computer, appears in the Network Connections folder as a wireless connection, and is enabled. If your wireless network adapter appears in the Network Connections folder as a wired connection, ensure that you’ve installed the latest driver that’s compatible with Windows 7. From the Manage Wireless Networks dialog box, you can add a new wireless network, remove a selected wireless network, obtain the properties of the wireless network adapter, and choose the type of profile to assign to new wireless networks (applies to all users or the current user). To manually add a wireless network, click Add to launch the Manually connect to a wireless network wizard, which will help you create a wireless network profile for either an infrastructure or ad hoc wireless network (see Figure 7). Figure 7 The “How do you want to add a network?” page. To create a wireless profile for an infrastructure wireless network, click Manually create a network profile. 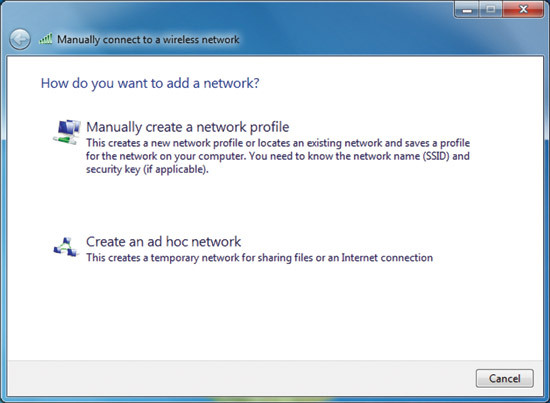 To create a wireless profile for an ad hoc wireless network, click Create an ad hoc network. To view or modify the properties of a wireless network in the list, double-click the name in the Manage wireless networks dialog box. Windows 7 displays the dialog box in Figure 8. Figure 8 The Wireless Network Properties dialog box. 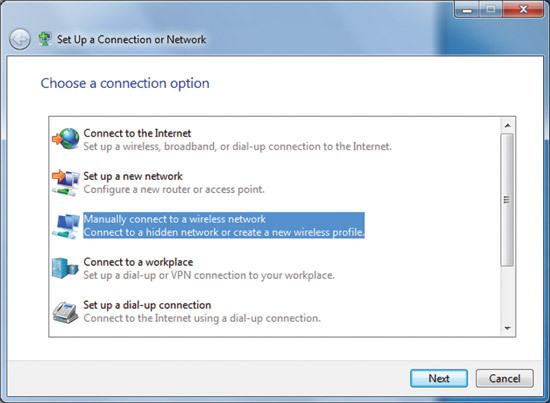 Connect to a more preferred network if available: Specifies whether Windows 7 will automatically disconnect from this wireless network if a more preferred wireless network comes within range. 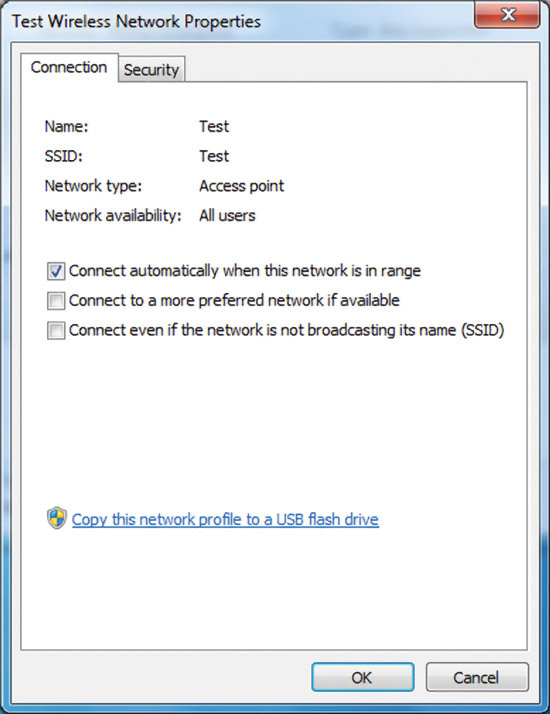 The Copy this network profile to a USB flash drive link launches the Copy Network Settings wizard, which writes the wireless network profile settings to a USB flash drive. You can then use this flash drive to automate the wireless network profile configuration of other computers. Figure 9 shows the Security tab. Figure 9 The Security tab of the Wireless Network Properties dialog box. Choose a network authentication methodSelect an Extensible Authentication Protocol (EAP) method and click Settings to configure the EAP type as needed. Remember my credentials for this connection each time I’m logged on: Specifies that when the user logs off, the user credential data is not removed from the registry. If you clear the checkbox, the next time the user logs on, he will be prompted for credentials (such as user name and password). Figure 10 Example of configuring a network security key. If you choose the WPA-Enterprise, WPA2-Enterprise, or WPA2-Personal security types, you can also configure advanced settings. 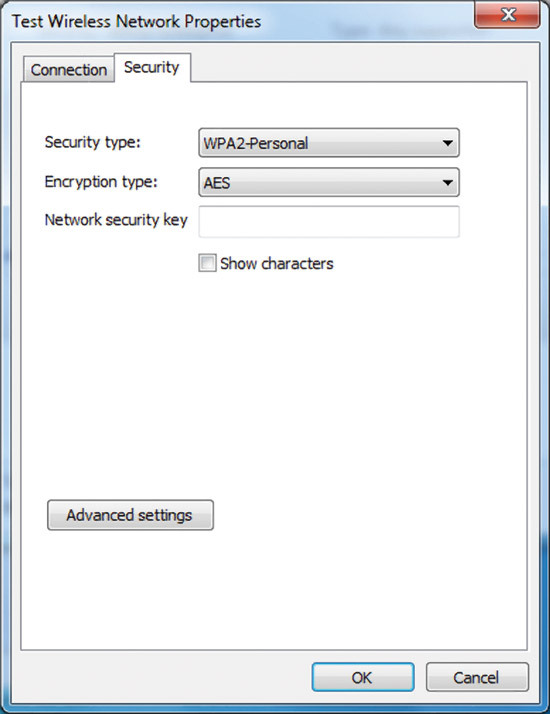 Figure 11 shows the Advanced settings dialog box for the WPA2-Enterprise security type. Figure 11 The 802.1X settings tab. On the 802.1X settings tab, you can specify the authentication mode (User or computer authentication, Computer authentication, User authentication, or Guest authentication), save a set credentials for user authentication, and delete credentials for all users. 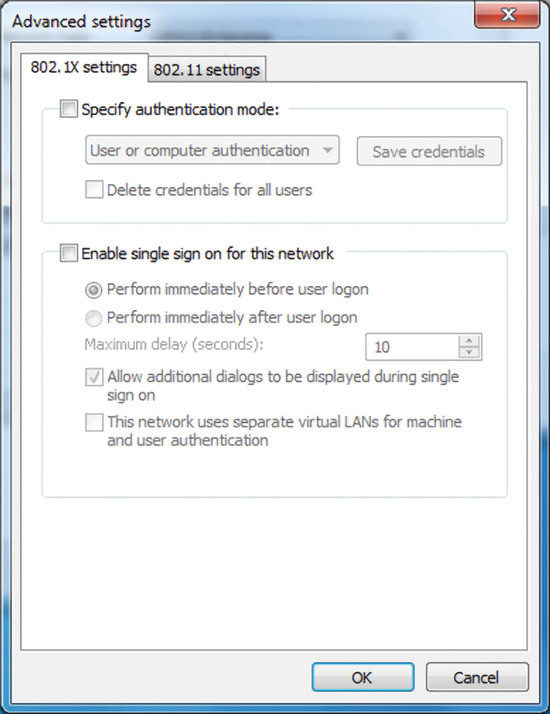 Single sign-on (SSO) lets you configure when 802.1X authentication occurs relative to the user logon and integrate user logon and 802.1X authentication credentials on the Windows logon screen. For more information about SSO settings, see Wireless Group Policy Settings for Windows Vista, the April 2007 The Cable Guy article. Figure 12 shows the 802.11 settings tab. Figure 12 The 802.11 settings tab. In the Fast roaming section, you can configure Pairwise Master Key (PMK) caching and pre-authentication options. For more information about fast roaming settings, see Wireless Group Policy Settings for Windows Vista, the April 2007 The Cable Guy article. Note: When you select the WPA-Enterprise security type, the Advanced settings dialog box does not contain the 802.11 Settings tab. The Enable Federal Information Processing Standard (FIPS) compliance for this network check box lets you specify whether to perform AES encryption in a FIPS 140-2 certified mode. FIPS 140-2 is a U.S. government computer security standard that specifies design and implementation requirements for cryptographic modules. Windows 7 is FIPS 140-2 certified. When you enable FIPS 140-2 certified mode, Windows 7 performs the AES encryption in software, rather than relying on the wireless network adapter. This check box only appears when you select WPA2-Enterprise or WPA2-Personalas the authentication method on the Security tab. A non-broadcasting wireless network doesn’t advertise its network name, or SSID. You can configure a wireless access point of a non-broadcasting wireless network to send Beacon frames with an SSID set to NULL. A non-broadcasting wireless network is also known as a hidden wireless network. 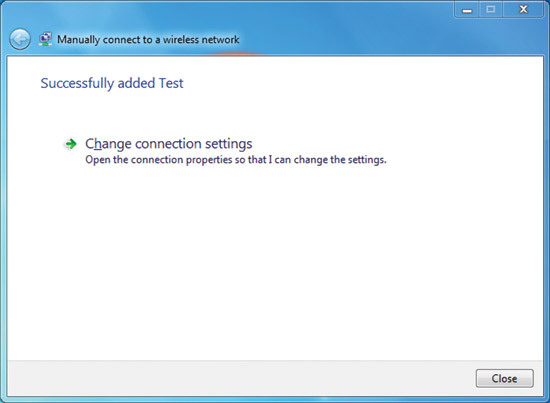 You can configure wireless networks in Windows 7 as broadcast or non-broadcast. 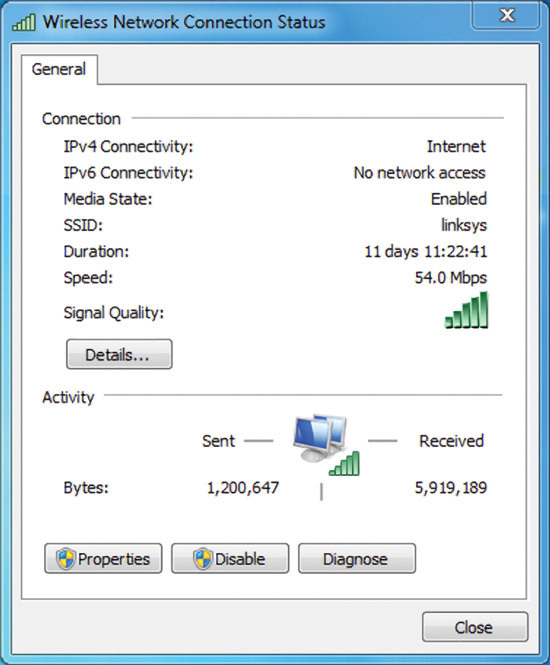 A computer running Windows 7 will attempt to connect to wireless networks in the preferred networks list order, regardless of whether they’re broadcast or non-broadcast. Additionally, non-broadcast networks appear last in the list of available networks with the name Other Network. Figure 13 shows an example. Figure 13 A non-broadcast wireless network. 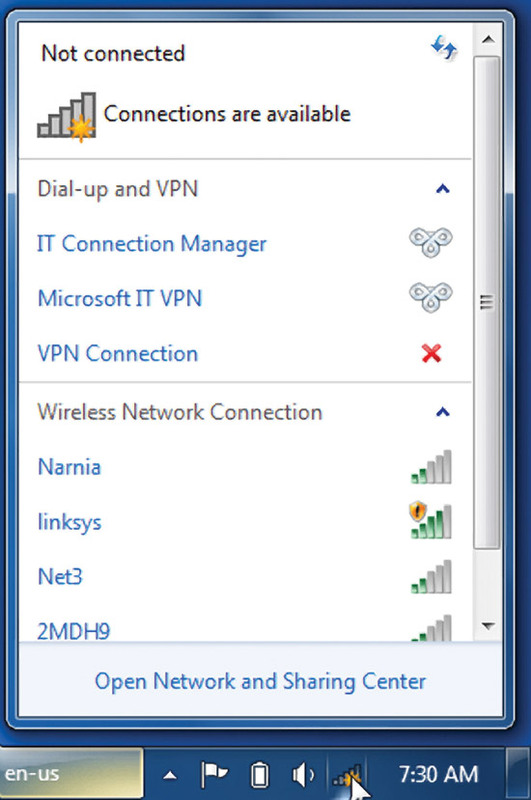 When you connect to the Other Network, Windows 7 prompts you to specify the wireless network name (SSID). Figure 14 shows an example. Figure 14 Typing the name of a non-broadcast wireless network. All The Cable Guy articles, click here.